I want to talk about ghosts, those scary, shadowy phantoms that haunt all of us. The dictionary definition of a ghost is a dead person’s soul, imagined as a vague, shadowy figure. My definition is a bit different. Now maybe I watched too much Casper when I was young, but I think ghosts are typically friendly and they’re usually trying to teach humans a lesson. Aren’t ghosts just people spirits in 32% transparent bodies with a 78% vivid light outer glow? Yeah, okay, I spend too much time with Photoshop. I do believe ghosts can be dead or alive. Whether it’s the dead ones that are completely invisible or the live ones that are in plain sight, their presence is known. Yesterday I visited one ghost, and two ghosts visited me. I have to say, I didn’t want to see this ghost anymore than Scrooge did, but I reluctantly, yet intentionally decided to visit him. This particular ghost is one that I usually don’t go searching for, but I thought it might shed some light on my Christmas beliefs and struggles with our existing Christmas culture. This particular ghost is a vintage Poloroid camera, as the ghost of Christmas past has presented himself in photographs. The person behind the camera? My grandpa. He passed away many years ago and I miss him terribly. My grandpa was a shutterbug and also the designated family photographer. My first exploration took me to a large box in the garage, filled with old photos that belonged to my grandparents. I enjoy looking at the past, captured through my grandpa’s eyes, on these little black and white squares. I love visiting this box, but you couldn’t tell that from the amount of dust on it. I searched though the box, looking for any Christmas photos I could find. I found Christmas photos of my dad, aunt and cousins. 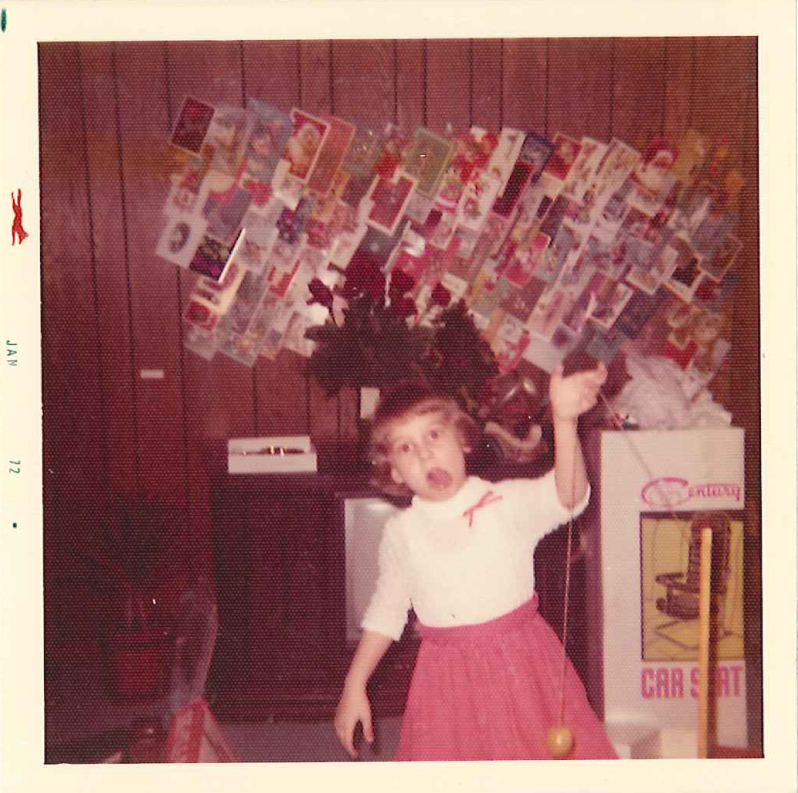 The second part of the search took me to my own childhood albums. These albums were meticulously organized by my mother, every photo page referencing my age in years and months. I can only imagine what these albums would look like had they known scrapbooking back then. Not only do these albums contain photographs, but every birthday card I ever received as a child. There must be hundreds of them, and I would venture to say, there are as many cards as photos. I guess that explains why I don’t like cards. All those cards are symbolic of how many superficial contacts my parents had, it was the number that meant something, not the depth of the friendships. Christmas was no different, there were hundreds of cards taped on the wall, creating an oversized map of numerical acquaintanceships. It looked to me like the US, and if anyone looked closely enough, I expect they would have seen tiny little cars driving aimlessly all over it, looking for an unknown destination. I was an only child until the age of 13, and I was the poster child for ‘spoiled brat’. 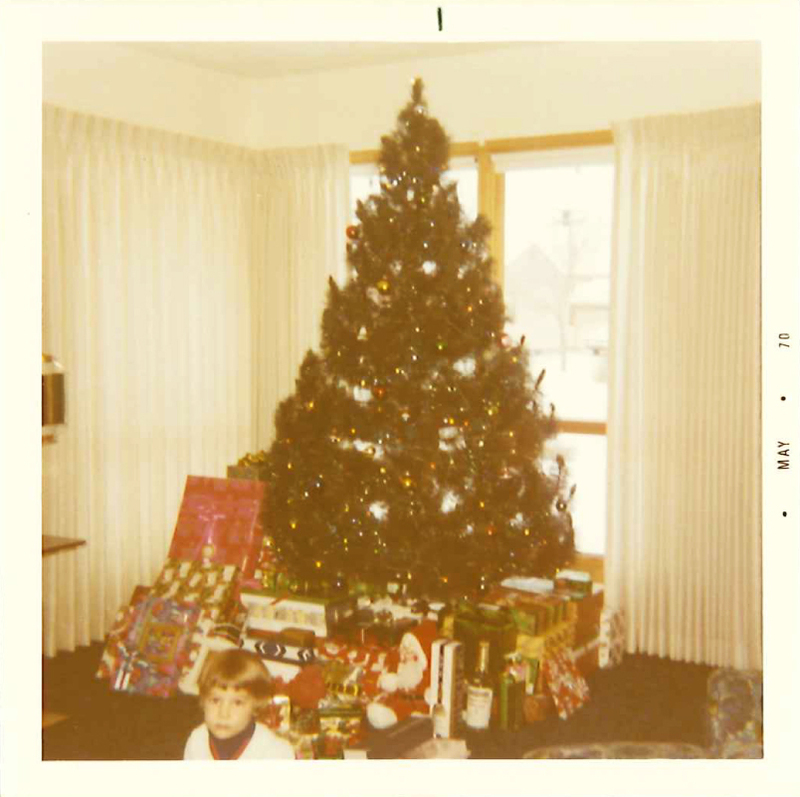 The photos I found depict the excess of gifts, boxes in such large quantities they spilled out into the room from under the tree. I remember getting so many gifts, my mom always shuffling me toward the things she liked best, asking me how much I liked this and how much I liked that. She was buzzing around the gifts, all the while, reminding me how lucky I was to get all this stuff. 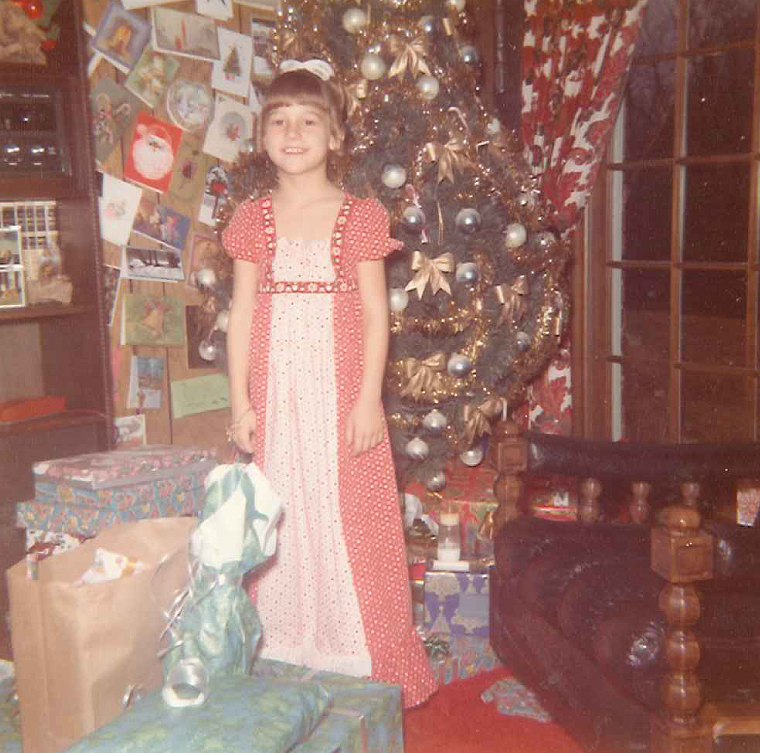 As a child, I remember it being fun getting so many presents, but the moment it was over, the emptiness set in. I saw my friends and neighbors celebrating Christmas and I could tell, even at that young age, that they were experiencing something I wasn’t. It looked nice, felt warm and seemed surreal, yet I had no idea what ‘it’ was. The ghost of Christmas past brings a melancholy gloom, but visiting with this ghost gives me hope. A hope that I might be able to find ‘it’. Get it? Christmas ‘present’? I crack myself up! The really funny thing? This crazy ghost manifested herself in the form of a present, and yes, she led me into the abyss of retail madness. The human ghost behind the present is Candy. Remember me telling you a few days ago that I needed to buy one more gift? Yesterday, I set out to find a pair of mismatched shoes for Candy. No, you couldn’t pay me enough to go to a mall to shop this time of year, although you could pay me to go there and people watch. I made my usual discount store rounds, looking for a specific ‘Converse’ style pair of shoes, but in two different colors and patterns. Now I haven’t been shopping in a long time, but when did all of the shoes turn brown and black? What happened to all of the fun colors and styles? Boring! I received some strange looks as I asked for help, and as I’m guessing, nobody actually goes to the store to purposely purchase a pair of mismatched shoes. I have to say, I was very excited to find a pair of Sketchers for $16.99. Yeah! All I have to do is find another inexpensive pair in the same style, now how hard can that be? Let me just say that I never intentionally bought a pair of mismatched shoes. My favorite pair? One came from Kelly Tuggey, the other from a thrift store. I really needed to get back to work. Where should I go to find another pair to stylistically match? Running out of time to find a deal, I had to settle for a higher priced place. 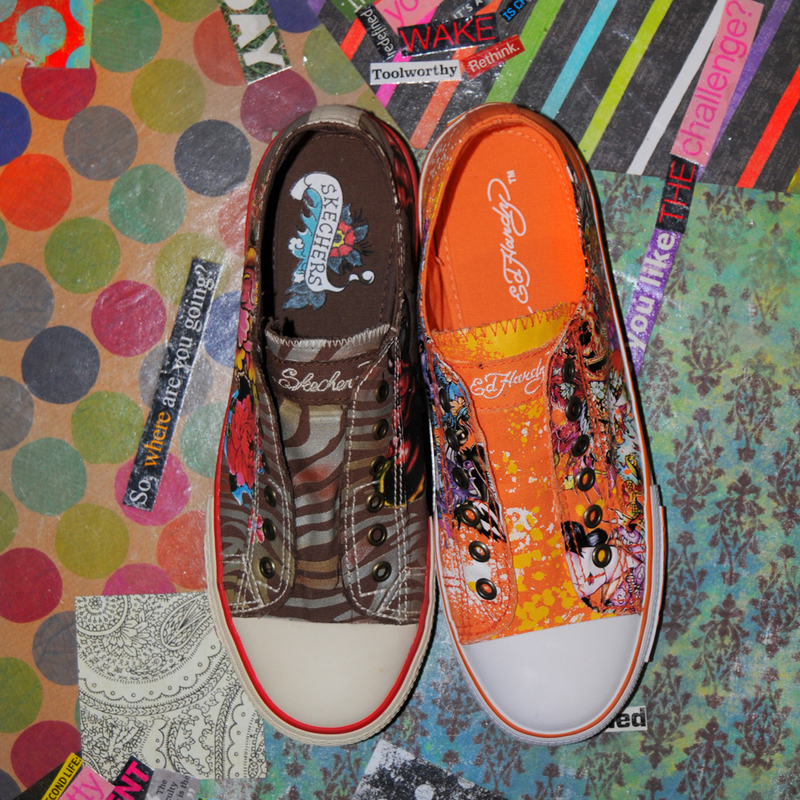 I finally found a pair of orange Ed Hardy shoes. Yes Geoff, I paid $49.96 for these puppies! I know I will never hear the end of this. That was about half of what they would cost at the mall, but it’s way more than I would ever consider spending for a pair of shoes. And don’t get me started on the statement part of this! Ed Hardy… phssshhh. So what did I learn from this ghost? I learned that sometimes it’s good to do things you wouldn’t normally do. The cost, whether financial, emotional or otherwise, is very worth it. Even though I won’t be there to see Candy open her gift, I know that she will love the shoes. I’m going to write her a note and have it translated, telling her that she is special and loved not only by me, but everyone. Yes, Candy is a very special ghost. I met the ghost of Christmas future last night and her name is Flo. She was at the nursing home where our church was hosting a Christmas party for the residents. This is a photo of Flo talking to one of the kids at the party. The little girl was asking what her name was and Flo replied, “My name is Flo. Pretty crappy name, hey?” She had my full attention now. Flo and I have the same hair philosophy, wash it, go to bed, and whatever you wake up with is the new style of the day. Capturing Flo in a photo was a difficult task, as she was working the room at an unbelievably rapid pace. Her walker, with tennis ball feet, must be jet propelled. 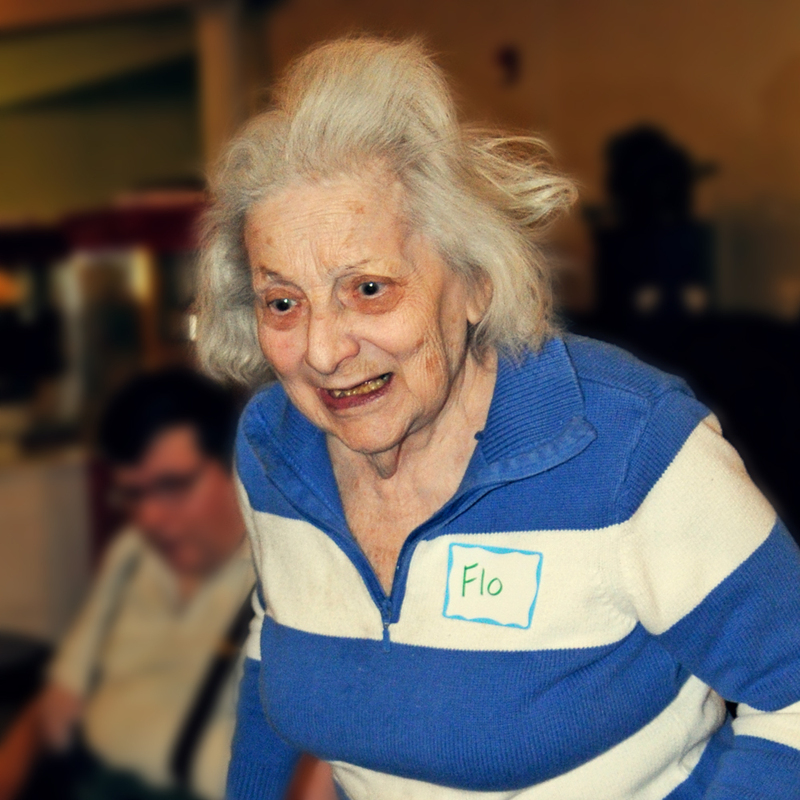 Flo is cute and spunky, and in her day, I bet she was a blast to hang out with and had many friends. Flo disappeared from the party early, I’m assuming to get ready for bed. A while later, a large group of us went caroling down the halls. There were four wings, and I so desperately wanted to find Flo again. Toward the end of the last hall, there it was, Flo’s room. She and her roommate were sleeping. I see Flo as the ghost of Christmas future because that will probably be me in 40 years. We were not allowed to take photos in the rooms, you know, all that HIPPA junk, but when I saw the painting hanging over her bed, it took my breath away. I had to secretly snap a photo. 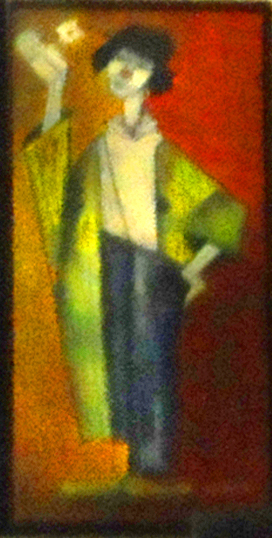 In the nursing home filled with small traces of personal artifacts, arranged into the same basic, beige shell, this colorful painting spoke loudly about Flo. I knew the moment I saw it hanging over Flo’s bed, that she loved color… and loved life. I so terribly want to know her story, but Flo’s memories have been stolen from her. Sadly, Alzheimers, or whatever she has, might have taken her memories, but it made me happy that it did not rob her of her wonderful personality. I told my kids about Flo last night during our prayer time. Joe prayed for her not to die before he had a chance to meet her. She might be his ghost as well. We can all learn from our ghosts, and whether you go seeking them or they come to haunt you. Don’t be frightened. Also, don’t ignore them. Remember these are friendly ghosts, and they want to show you something in your life through their own human experience. The Christmas spirit? Yep, it’s a ghost, and I think I’m a little closer to it now. I can’t believe it’s only eleven more days until Christmas. There’s still so much to do before then, right? Where is my Christmas to do list… wait. I didn’t make one, nor do I really have many Christmas things to do. Plenty of other busyness, but not as much related to Christmas, with the exception of work. So someone please tell me why I feel so busy and stressed? I suppose I do have two things that come to mind that are Christmas related. I promised Dulce, or as we call her, Candy, a pair of mismatched shoes for Christmas. 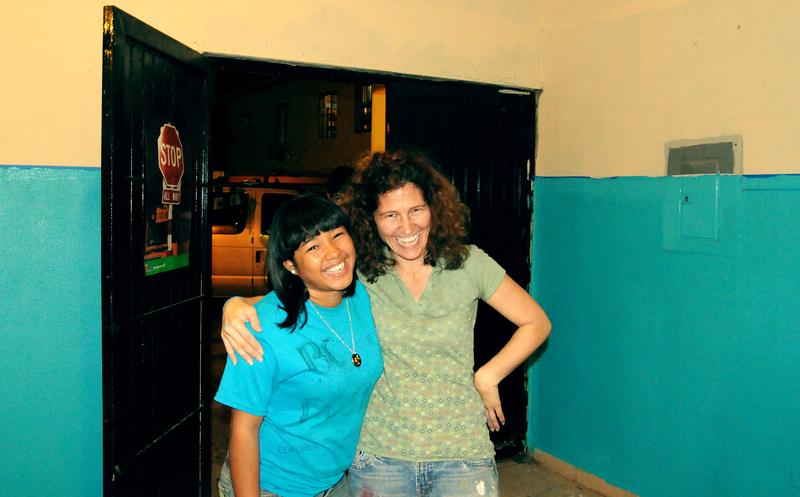 Candy is one of the beautiful kids down at Casa Hogar Elim. Her name fits her well. Every time I’m down there, Candy has the biggest hugs and the biggest smile, not only for me, but for everyone. If there’s a poster child for the love we feel from CHE, it’s Candy. She has always been intriguged by my carefully, deliberately mismatched shoes. Now Candy speaks about as much English as I do Spanish, so her desire to have a pair of mismatched shoes has been communicated through loving charades. As much as I am looking forward to selecting this meaningful gift, there is no part of my being that wants to go anywhere near a mall or retail store. The only stores I have been to over the past month is a few used bookstores and stores with groceries. Food and books. Life’s necessities. Well, we can add mismatched shoes now too. I will keep you posted on my future shopping adventure. The other thing I have to do is get passports for my kids. This is their big gift from me this year, and besides a few small gifts of books and such, that’s it. We are supporting charities for Christmas this year instead of buying a bunch of stuff we don’t need. And the beautiful thing about this? My kids are okay with it. At 9 or 10 years old, being the spoiled brat I was at that age, I’m not sure I would have accepted this paradigm shift from my parents. Now one would think getting a passport might be a simple process, but like everything else in our bureaucratic, complex society, it is not. Their dad had to sign release forms, which also had to be notarized, and luckily he did. I suppose he didn’t have any desire to spend two hours in line with me any more than I did him. I took the kids a week ago right after school to get their passports, only to find out they only issue them between the hours of 10 and 3, Monday through Friday. I guess my choices are to pull my kids out of school or take them downtown and pay the enormous one day rush fees. I’ve decided. I’m going to pull the kids out of school one day this week and make a fun day of it. We’ll go to lunch, get the passports and do some other enjoyable things. I never thought I would look forward to standing in a line at the post office, but for this, I am. 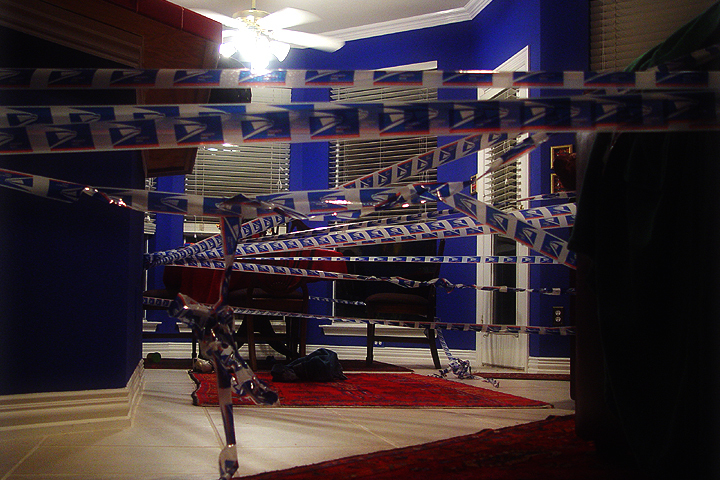 Maybe they will get creative with the Priority Mail tape like they did several years ago. I want to teach my kids the right things, unlike what they learn by participating in our culture’s methods. When I was in Zambia five years ago, I caught a glimpse into a different world. It was a shocking world, as they had no electricity, no running water and none of the modern conveniences I had and take for granted. On a two hour bus ride, without my camera, I saw a happiness and contentment in people that I had never seen before. Had I not had my kids to come home to, I might have jumped off the bus and never been seen again in the US. I have to say, my first reaction to this scenario was that I wanted to give these people all of the things I had, not just the essential commodities, but the things that make us happy. Computers, internet, flat screen TV’s, cell phones, cars, kitchen appliances, toys and the list goes on. Yet something didn’t feel right. It didn’t take me long to see that these people had something I didn’t, but something I desperately wanted. Something I still greatly want. Peace. Happiness. Fulfillment. And most of all, contentment. 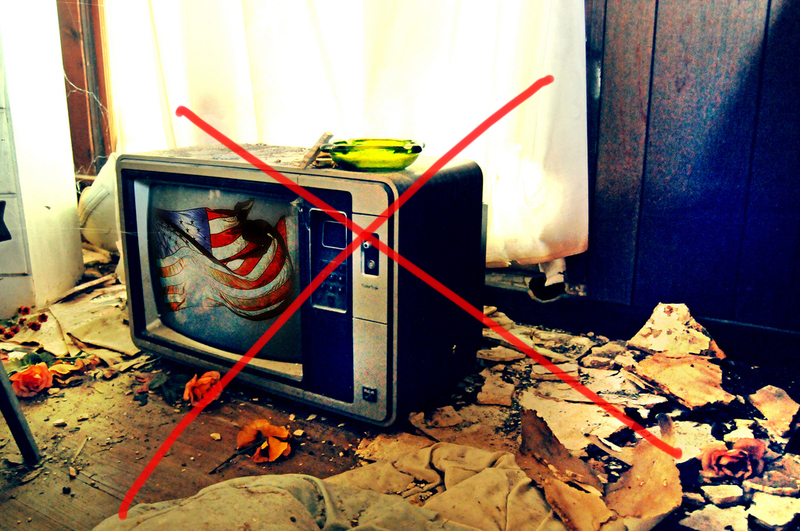 I’m not quite sure how or when my thought process changed, but I have no desire to give them a TV anymore, or any of the other things we can’t live without. I do still want to give them clean, running water and warm shelter though. I wish I had never been spoiled by all of the materialism and possessions of our American culture, because now I’m addicted. I need my computer and my iPhone. I need my nice house and my car. Could I experience true happiness with out all this stuff? I feel burdened with my knowledge, shackled with electronics and locked in a cell of selfishness and greed. I know these people I’m speaking of have a whole different set of struggles in life, but they get it. They are happy and content. Why? Because they don’t have all of the distractions to keep them from having deep relationships with the people around them. I’ll bet they aren’t looking for the Christmas spirit like I am. I hope to someday experience just tiny bit of what they do.